Casa Vicens is the first house that Antoni Gaudí built in the city of Barcelona, specifically in the Vila de Gràcia. A few years after the Gràcia’s annexation into Barcelona, Antoni Gaudí carried out another project in Gràcia, a lesser-known work by the architect but one which is especially interesting from the point of view of the person who had to live there. This was the house that he designed for the painter Aleix Clapés, located on carrer Escorial 125, built between 1899 and 1900. Aleix Clapés (1850-1920) was a painter trained in the School of Fine Arts in Barcelona and in Reus, where he received training a muralist. He collaborated with Antoni Gaudí in the pictorial decoration of Palau Güell, most notably the mural entitled Hercules Searching for the Hesperides, and he also collaborated with the architect by directing the pictorial decoration of La Pedrera. Aleix Clapés was not involved in decorating Casa Vicens (at present, there is no indication which points to this hypothesis), but there is certainly a link between the painter and Gaudí’s first house. In 1910 Aleix Clapés made a painting of the house together with Francesc Berenguer. The painting is an exterior view of the western façade, where we can clearly observe what this part of the building looked like in its original era, before the expansion in 1925. The work, whose current ownership is unknown, was exhibited in 1910 in exhibition on Gaudí organised in the Grand Palais in Paris. 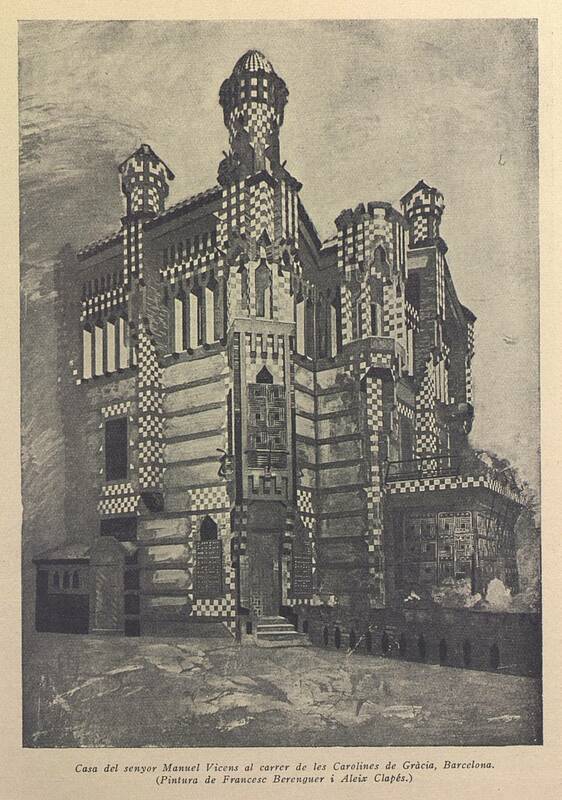 Drawing of Casa Vicens done by Aleix Clapés.